I created this Thanksgiving centerpiece using a vintage tray, vintage candles, pinecones from friends, shells from Detroit Lake and letters from my 1970s Scrabble game. A new baby on the way with our second grandchild (a boy) due in less than two months. Skilled medical professionals who cared for me, encouraged me and helped me recover after surgery on a broken wrist. A husband who exuded absolute calm even when I semi screamed at him to drive faster to the hospital emergency room. A son and his girlfriend who baked and mailed chocolate chunk cookies from Boston as I recovered from wrist surgery and again in celebration of my birthday. Minimal damage on and to our property following severe storms and tornadoes that swept across Minnesota on September 20. I am especially grateful for significant advance warning. An extended family that still gathers in my hometown each July for an annual reunion that includes aunts, uncles, cousins and their families. The opportunity to blog regularly for Warner Press, a Christian publishing company in Anderson, Indiana. Friends who support, pray for and encourage me, as well as make me laugh and wrap me in their love. My 2 ½-year-old granddaughter. No other words needed. Several days away at a northwestern Minnesota lakeside condo, thanks to the generosity of friends who couldn’t use their entire timeshare week. This was a first for Randy and me and exactly what we needed. Sometimes all I really need, though, is to pause for a moment and consider my blessings. Of which there are many. TELL ME: What are you especially thankful for this Thanksgiving? A few years ago I found this vintage 1976 calendar at a garage sale. Each year prior to Thanksgiving, I hang it in my dining room as a representative reminder of life’s blessings. WHEN I CONSIDER THANKSGIVING, I visualize the tapestry of my life woven with gratitude and blessings and, yes, even sadness. Sometimes I’d like to yank the black threads and pull away the darkness, leaving only vivid hues of happiness. But to do so would present an imitation of my life, a cheap knock-off work of art that portrays the idealistic rather than the realistic. I don’t care who you are, where you live, what you do, you are the accumulation of life’s experiences—positive and negative. Challenges, whether financial, health-related, personal or otherwise, shape us, make us stronger, teach us empathy and compassion and how to handle grief and anger and disappointment and frustration and pain. At the time we battle difficulties, we usually fail to see the good, the reason to give thanks. Often that comes later, as time passes, acceptance comes, situations change and reflection happens. For example, I was bullied as a pre-teen by junior high classmates so ruthless and mean that I hated school. I cried every day, wished the teasing would end. It should have. But in those days, no one stepped in to stop the abuse. And one teacher in particular was himself a psychological abuser. Because of those two unbearable years, I hold zero tolerance for abuse whether perpetrated by a child, teen or adult. I use my words now as a way to educate, to help others, to advocate, to make a positive difference. When I consider personal health challenges like severe osteoarthritis and resulting hip replacement, a broken shoulder, and near deafness in my right ear, I see how my empathy for others has grown, how my patience lengthened, how my thankfulness for my husband deepened. Threads of gold shimmer in the tapestry of my life, outshining the underlying less-noticed darkness of difficulties. My life remains a work of art in progress. There are days when life circumstances seem overwhelming, when the mother in me wants to make everything better. But then I hear an uplifting song, get an encouraging email or text, hold my granddaughter, hug my husband, write something especially meaningful, talk to my son too far away in Boston, gather with friends, reach out to someone hurting. Then threads of silver and gold sparkle gratitude and thanksgiving for this life I live. Not perfect. But beautiful in blessings. Today, may you find many reasons to give thanks for your life. Happy Thanksgiving! FIFTY MILES FROM FARGO, he called his dad. His words were garbled, cutting in and out. So he hung up, dialed my cell. “Give me Dad,” he snarled. I waited, listening to one side of a conversation that did not sound good. After my husband clicked off my phone, he told me that Julie’s car had broken down near Fergus Falls. Our son’s friend had managed to steer the smoking vehicle off Interstate 94 at eastbound exit 50. 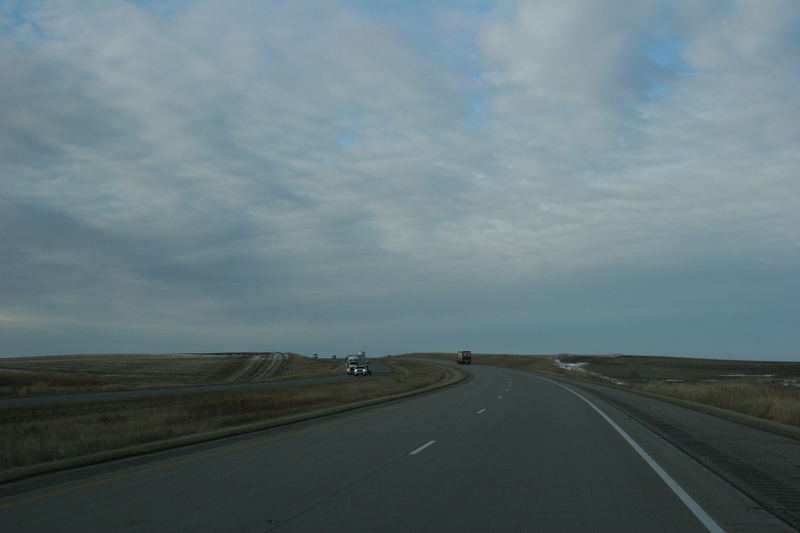 There they sat, four North Dakota State University college students stranded along the interstate on Thanksgiving Eve with nearly 250 miles to go. What to do? We offered to drive the four hours north and west to Fergus Falls. But Caleb told us to wait, that they were trying to figure things out, to find a tow truck and perhaps hitch a ride from another friend back home to Faribault. I asked Caleb to keep me posted. And eventually they worked it out, securing a tow and ride, walking from the mechanic’s shop a short distance to a nearby convenience store, waiting for the friend to arrive from Fargo. By 9 p.m., they were back on the interstate, 2 ½ hours after that initial SOS to my automotive machinist husband who was trying to long-distance diagnose problems with an aged Honda. Shortly after our son and three others left Fergus, Julie’s dad phoned saying her car had already been repaired. (Phil didn’t know the specific diagnosis.) Julie had insisted on staying with her vehicle, sending the others on their way home. My husband doubted anyone would repair the Honda on Thanksgiving Eve, or anytime prior to Friday. He was, obviously, wrong. So we waited, me reading, my husband nodding off as the television blared and the minutes crept into hours, past midnight and then 1 a.m. Shortly after 1 a.m., our son arrived home and we embraced in fierce, tight hugs. I was so relieved to have my boy home early Thanksgiving morning. But there is more to tell, for this is also a story of thankfulness. Thank you to the good people, the many strangers, who stopped to check on the stranded travelers at eastbound exit 50 by Fergus Falls. There were many, our son said. Thank you to the mechanic who repaired Julie’s car on Thanksgiving Eve. And thank you to the young woman who was willing to drive three other college students 250 miles home. On this Thanksgiving Day, I am a grateful mother.